GLOBAL – One month after hundreds of thousands of people took to the streets to demand real climate action as part of the Rise for Climate Mobilisation, the world’s scientists have issued their clearest call for avoiding the worst impacts of a warming world. The Intergovernmental Panel on Climate Change (IPCC), UN-backed body of scientists, just released its special report on Global Warming of 1.5 ºC. The study confirms that limiting the rise in global temperatures to 1.5°C would be significantly better than breaching the 2°C threshold, supporting calls for a definitive stop to fossil fuel use and a rapid transition to energy systems based on 100% renewable energy. “The science in the IPCC report on 1.5°C speaks for itself. Staying under 1.5ºC is now only a matter of political will. Burying our heads in the sand cannot be contemplated as an option any longer. The climate crisis is here and already impacting the most vulnerable and the least responsible for creating it. The only way to achieve it is to stop all fossil fuel extraction and redirect the massive resources currently spent on the fossil fuel economy towards the renewable energy transition”. Communities worldwide are already resisting fossil fuel development and calling for a deep transformation of our energy systems and economies. Some of these stories of resistance can be found in the newly released People’s Dossier on 1.5°C. The Dossier puts faces and voices onto the facts and data provided by the IPCC special report. It contains the stories of 13 communities fighting on the frontlines of climate change: from young Pacific Islanders trying to stop the Adani mega-mine to fishermen communities in Africa battling against new coal plants; from the struggle to stop a gigantic gas pipeline among the olive groves of Southern Italy to the landowners and Native Americans putting solar panels on the route of the Keystone XL pipeline. Over the next days, 350.org activists will also launch a globally coordinated delivery of copies of the IPCC report, demanding that all institutions withdraw their support from the fossil fuel industry and stand up to them before it’s too late. The IPCC report explores in detail the impacts of a world 1.5°C warmer than pre-industrial levels and the feasibility of avoiding greater increases in temperature, while current national plans -if implemented – are only consistent with a world over 3°C warmer. 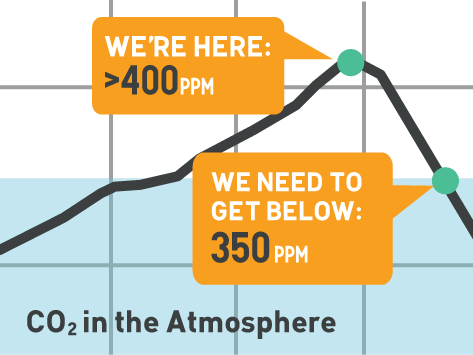 Keeping the world from warming over 1.5°C will prevent considerable disruption to all of the Earth’s systems and allow for some ecosystems to partially recover from climate change after 2100, knowing that 20% to 30% of emitted CO2 will remain in the atmosphere for a time ranging from a few hundred to a few thousand years. The 1.5°C target is feasible, provided enough economic resources are invested early enough to dramatically accelerate the phase-out of fossil fuels and the uptake of renewable energy and energy saving technologies across the board. Within the next decade or so, we will need to radically change the way we build our houses, move from one place to another and grow our food. Delegates of national governments met in Incheon, Korea, over the course of last week, to negotiate line-by-line the so-called Summary for Policymakers (SPM), the executive summary of the report which is supposed to inform policies. Despite attempts to water down some critical language in the SPM by key countries such as the US, the underlying science in the roughly 1000-page long report doesn’t allow any national government to downplay the magnitude of the document’s findings and the need for a rapid phase-out of fossil fuels.